She is also well-versed in sophisticated matrimonial litigation and alternative dispute resolution. Lindsay was previously a law clerk to the Honorable Thomas J. Walsh of the Superior Court of New Jersey, Union Vicinage, Family Part, Matrimonial Division, as well as a judicial extern to the Honorable Thomas C. Moore of the Superior Court of New Jersey's Chancery Division, Family Part, Essex County. Before joining Fox, Lindsay worked at two New Jersey boutique matrimonial law firms. During law school, she also clerked at a Jersey City family law firm and a Newark law firm. 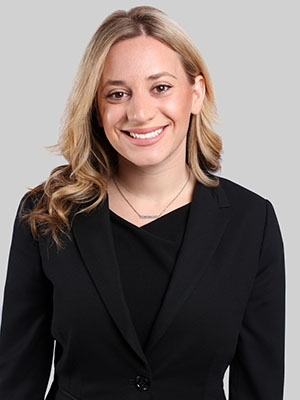 Lindsay interned at the Seton Hall Law Center for Social Justice in the Family Law Clinic and served as a student advocate for the Southern District of New York Mediation Practicum. Lindsay volunteers as a pro bono attorney for Unchained At Last, a nonprofit organization dedicated to helping women and girls leave or avoid arranged/forced marriages and rebuild their lives. There, she represents a client seeking a divorce from a forced marriage. Lindsay sits on the board of trustees and is the secretary for Hudson County Court Appointed Special Advocates (CASA) and is a member of the District VI (Hudson County) Ethics Committee. Additionally, Lindsay works with Volunteer Lawyers for Justice, where she assists litigants with navigating the divorce process and preparing post-judgment pleadings for child support modifications.